It all started when I was a 5th grader. We started a child club called Bal Yojana Samuha (Child Planning Group) under my chairmanship. It was the first of its kind in the municipality, Ramgram (Nawalparasi district). So, we did not have any seniors to follow. Instead, we were supposed to inspire the posterity. Personally, I was very much interested in reading articles and columns in newspapers and magazines. In fact, I could recall the names of all the famous writers and columnists. I think my novice brain must have seen my potential of being an editor someday. My father was an employee at District Administration Office. The office had a section: District Child Welfare Board. This section received a lot of child magazines from all over Nepal. So, this is how I had access to the magazines which talked a lot about “wall journals”. And, this ignited my innovative mind to start something of that kind in my very own school as a mouthpiece of our club. We were neither trained nor had we ever seen our seniors publish such journals. So, we were left on our own to discover all the processes of preparing a wall journal. We used to have our wall journal inaugurated at assembly hall by our principal. Well, that used to be a very proud moment for me, being a young editor-in-chief. Our club had a group of creative members to work on the journal. Friends who had beautiful handwritings and drawing abilities contributed to the journal. I used to collect news of school activities, world news and interesting discoveries for the journal. The journal always looked very catchy to the eyes after the final touch. The entire process took two days and the moments after we finalized it used to be very exhilarating. The same year something very unpleasant happened. I got a red line in my report-sheet of second term examinations. Yes, I failed in a subject. The paper was very tough and many other class-mates also got a red line in their report-sheet. If rumors were to true, even the guy who was in the third rank of the class failed but the teachers pulled him out of it. It came from a highly reliable source. So, I went straight to the principal's desk and warned him to publish news regarding the issue in the journal. This all sounds very weird and funny today. Eventually, I got promoted to upper grades. I was growing mature. Opening child clubs was like a popular fashion. Following our path, several other schools and children opened child clubs. Seeing the growing number of child clubs, I thought something must be done to bring all these clubs under a network. So, under my chairmanship, Child Club District Co-ordination Board was established. It was the first of its kind in the entire Western Development Region. Afterwards, UNICEF showed interest to help us publish the magazine. District Child Welfare Board (DCWB) wanted elders to take the responsibility. Later, those officials agreed on giving the responsibility. Besides, I had already edited and published a magazine, Usha. During, the publication of Usha, we had raised about 20 thousands (around 300 $) from the advertisements. Since, we were being financially supported by UNICEF, we could focus entirely on the quality of the magazine. To be frank, I haven’t taken any training to improve my writing ability. I developed this ability by practice and by reading the articles from the magazines my father had subscribed (viz.Nepal, Himal etc.). I used the skills I acquired by reading those articles in the magazines. Though I was very young, I was respected for who I was, an editor of a child magazine. Our team published children’s issue with high priority. So, some national magazines wrote very highly of our team work. As mentioned earlier, I was a great fan of some of the columnists. I would like to recall a small incident. The then editor of Nepal magazine, Sudheer Sharma (currently editor of Kantipur Daily) wrote a very fine report about Maoist insurgency in Nepal. At the last page, he wrote ‘I’m leaving Nepal (mag).’ I also wanted write in the similar fashion. So, I also left the post of editor of Usha. Many people did not want me to leave the post. But, what I did was for its best. I wanted to give juniors a chance. And, I feel so happy that they are doing very well. I used to send my articles to national dailies like Kantipur, Gorakhapatra and the Himalayan times. In 2007, I graduated from the school in Parasi with distinction marks (86.63%) in the SLC board. Unknowingly, I had set an example. Even these days, my school principal asks the students to follow my example. Students in Parasi remember me as person who was able to handle both the studies and extra carricular activies. 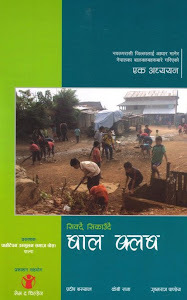 Later, my articles started to get published in Kopila, Kantipur’s supplement for children. Rajesh Koirala, Kopila’s coordinator, instructed me on how to improve writing skills. Besides Kantipur, my feature articles mainly on children’s issue were also getting published in other national dailies like Nagarik, Gorakhapatra, among others. I was in my mid-teens. I did not want to limit myself in children’s issues. I was being continuously encouraged to explore the other genre as well. So, I went exploring other genre of writing. As I was a science major in my high school, I wrote many scientific articles as well. I even wrote about UFO in a tabloid, Saptahik. That was an exclusive cover story of the tabloid. I was just 16 when I wrote that. Now, it has been almost a year since I started contributing regularly for Kantipur national daily. 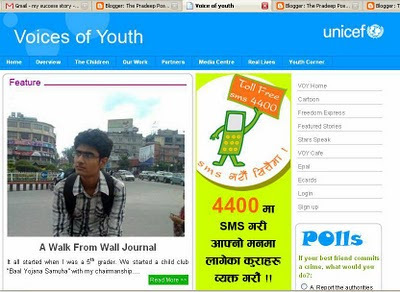 I got this opportunity to write for Hello shukrabar, youth supplement of Kantipur Daily. My columns are published evey fort night. I can say it proudly that I am one of very few columnists to start writing this early. I am very thankful to Mr. Deepak Adhikari, a senior assistant editor at Kantipur Daily. He is the one who taught me journalism. He is one of the very few Nepali journalists who write for international publications such as TIME, The Guardian, among others. He trusted me just by reading a single article. It must have been a tough decision for him to trust me who had no prior experience in writing articles in a national daily like Kantipur. And, working under him turned out to be very fruitful for me. He encouraged me to write features for Hello Shukrabar. I got a whole new opportunity to learn and explore due to my guru Deepak Adhikari.